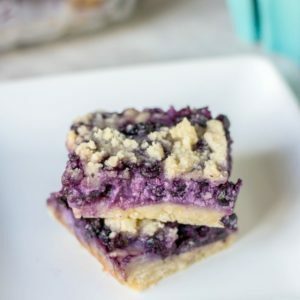 These sour cream blueberry pie bars are a cross between a custard blueberry pie and shortbread blueberry bar for one delicious treat. In a large mixing bowl, combine flour, 1/4 cup sugar, and dash of salt. Mix in the butter with a paddle mixer, pastry blender, or 2 forks until crumbly, and butter is distributed evenly. Reserve 1/2 cup of the mixture for later. With the remaining batter, press it evenly in the glass baking dish. Bake for 15 minutes. While crust is baking, mix together yogurt/sour cream, remaining 1/4 cup sugar, vanilla and egg together. Gently fold in the blueberries. When the crust comes out of the oven, pour the blueberry batter over the crust and sprinkle the reserved 1/2 cup crust batter over the berry mixture evenly. Return to the oven and bake for 45-50 minutes or until pie bars are set and crumble over top is slightly browned. Plain Greek yogurt can be substituted for sour cream. If using FROZEN blueberries, do NOT thaw and increase baking time by 5 minute intervals. Store leftover bars in refrigerator for up to 3 days.